Bestway was started in 1994. Ever since it was established, this company has devoted itself to keep growing in every aspect and manufacture products that actually cater to their consumers’ needs. 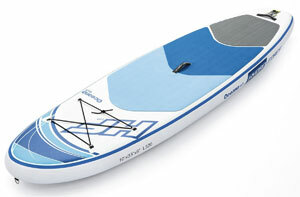 Bestway are well-known for affordable paddleboards, kayaks and other water sports products. In addition to making awesome products, the company is very clear on its intentions to mind the environment by collecting and recycling as much scrap PVC materials as possible. Take a look at these 6 fantastic Bestway SUP boards. 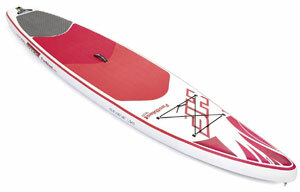 The Hydro Force Wave Edge is an iSUP with unmatched durability, perfect for the SUPer who wants to have carefree fun. It is made of military grade PVC, a material so tough that even if you run over it with your car it will still endure. This material is woven together using the Dropstitch construction resulting in the most durable paddleboard you have ever seen. The measurements of the Wave Edge give it a streamlined shape that makes it perfect for touring and racing. It features a tri-fin system that helps it navigate the waters very smoothly giving you the best padding experience. The deck is covered in an anti-slip pad that secures your footing. The pad is soft so you can SUP comfortably for hours. In the package are an aluminum paddle, inflation pump, travel bag and pressure gauge. Although the pump is manual, the board has a fast inflation and deflation valve to give you an easy time. There is a bungee cord for your cargo and a leash D-ring. Users like the Hydroforce Wave Edge. Everything about it seems to work just as advertised. It is easy to use and inflate (others still say it is better to have an electric pump). It is stable in water and very stiff when fully inflated. It is also very durable. The Hydro Force White Cap is the one thing everyone needs to have for summer (and even all other seasons, but mainly summer). 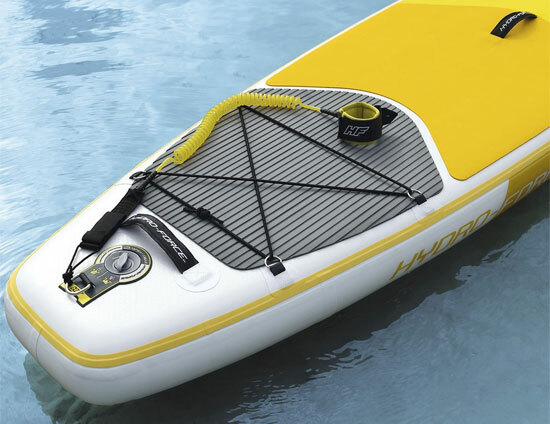 It is an inflatable paddleboard that doubles as a kayak. With it, you can spend as much time as you like in the water with no limitations whatsoever. It is suitable for people of all skill levels. 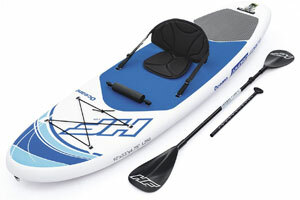 The paddling kit includes a travel bag, aluminum oar, gauge, pump and kayak seat with a backrest. This is an irresistible package, given the price. The bag comes in a very sleek design and has padded shoulder straps for added comfort. It is large and fits everything included in the package and leaves some space for your other essentials. The White Cap has three fins for stability and enhanced tracking in the water. There is enough space on the deck to strap the seat and sit comfortably. A storage system is conveniently attached at the front, within an arm’s reach. First of all, SUPers are very happy that the White Cap comes with everything. All they have to do is inflate and hit the water. When fully inflated, they say that it is just as stiff as a fiberglass paddleboard. In the water, this iSUP is stable and handles everything well. Users are blown away and amazed at how great this board is. The Hydro-Force Oceana Tech is a 10-foot inflatable paddleboard that promises to make your paddleboarding experience unforgettable. This board is suitable for all members of the family, regardless of age and skill level. Being an all-around iSUP, it can be used for different SUP variations and in almost all conditions. The board is 6” thick which makes it more rigid and stable compared to 4” iSUPs. It is 33” wide so there is ample space for moving around on the deck. The deck is largely covered with a non-slip traction pad to prevent slippage. This pad is also soft so you will be more comfortable on it than on a traditional fiberglass board. There is a conveniently attached carry handle at the middle for you to easily carry your board across the beach. Another great thing about the deck is the elastic bungee cord that allows to securely tie your stuff. 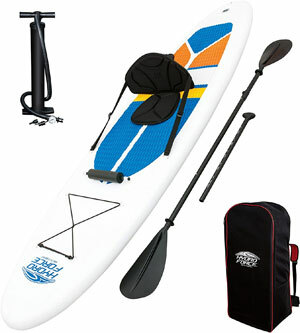 The contents of the package include an Oceana Tech paddleboard, deluxe backpack, hand pump, repair kit and surf leash. The bag is all kinds of cool and high quality. As you can see, it is totally worth its price since it comes with all necessary accessories. Manually pumping an iSUP can be a pain but there is nothing hard about inflating this particular one. You will be surprised by how fast you can get it to the maximum PSI. 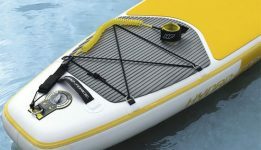 This amazing inflatable paddleboard comes in two colors, yellow and blue, for you to choose from. Although the Oceana Tech is fairly new, it is already gaining the love of users. First of all, it is very affordable, which is one of the most important factors that consumers consider before they buy. Riders love the contents of the package, especially because Bestway did not just throw in cheap accessories- they are quality products. This Hydro Force paddle board cuts through water smoothly, thanks to the tri-fin system. Overall, the paddlers agree that this is a superb board. The Aqua Journey is a well-made paddleboard, designed to serve you for a very long time. It is made of the strong and reputable PVC material which has been known to make world-class inflatable paddleboards. It measures 9’ x 30” x 4.75”. Given its measurements, the iSUP is best suited for kids. It is narrower, thinner and shorter than your average paddleboard. A heavier adult will find it less stable and it might sink in the middle. 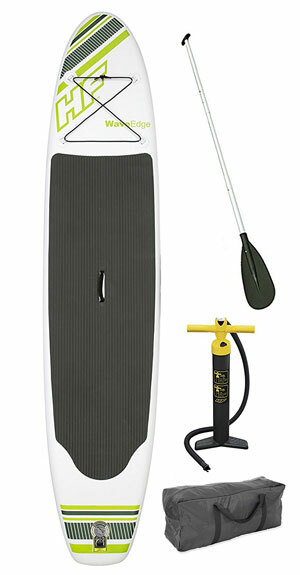 The board comes with an amazing paddling package containing an iSUP, hand pump, paddle, leash, bag, and repair kit. The paddle is made of aluminum and is adjustable so it can be used by different riders. The Hydro-Force Aqua Journey is an all-around paddleboard so you can use it for pretty much anything. SUP yoga, in particular, will be comfortable because of the soft EVA deck pad that does not hurt your knees, elbows, hands, and feet. 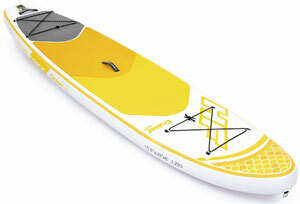 It is very light and has a tri-fin system so if you like speed you will love this inflatable SUP. The Aqua Journey has proved to be really great for kids and smaller riders. The package is totally appreciated because the riders do not have to go off looking for accessories (except maybe an electric pump which you can do without). This board is very light; which is always a good thing. The paddle, being adjustable, can be used by all family members and save money. Given the price, no one can really complain about the Aqua Journey. The Oceana is among the few inflatable paddleboards that offer a unique package deal. First of all, this white and blue board looks really beautiful. Although it has been placed in the all-around category, you will have so much fun going SUP touring (especially an overnight trip) with this board. It is wide enough at 33” to give you enough room to carry out your water activities. An elaborate bungee system is added for the convenience of keeping your luggage secure. The most outstanding thing about this paddleboard is its package. It includes an iSUP, hand pump, paddle, travel bag, leash, footrest, seat, and repair kit. The provided seat has a backrest and you can convert it to a comfortable kayak anytime. The unique 4-piece oar is adjustable. The deck is spacious and partly covered with a soft traction pad. This makes it comfortable when you stand or kneel on it for a long time and will also prevent you from slipping on the wet iSUP. The Hydro-Force Oceana paddle board is blowing users’ minds. It really is a fantastic iSUP and its package is giving it an advantage over its competitors. Riders have no problem with stability and stiffness as far as this board is concerned. Inflating and deflating it is easy although you might still need an electric pump if you do not want to waste any energy pumping. The package is great, no doubt. There really is no negative feedback on this inflatable SUP. There is something about yellow paddleboards. They have a kind of warmth that seems to make paddleboarding even more fun. You get a happy feeling looking at the Cruiser Tech and it might be just what you need. Now apart from the look, the other noticeable feature is the storage system. This board has bungee cords both at the front. No more restrictions on the amount of luggage you can carry. The Cruiser Tech is more of a touring board, which explains the storage system. However, inflatable paddleboards are versatile and you can use it for anything else. The measurements of this board are suitable for both adults and kids. The 6” thickness increases its weight limit and does not sink in the middle. It has three fins, one big one, and two smaller ones, to help with slicing through the water. A traction pad covers a large part of the deck for your stability and comfort. Apart from the D-rings with attached cords, there are two more; one at the nose for towing and the other on at the tail for attaching your leash. The package of the Hydro-Force Cruiser Tech includes an iSUP, pump, backpack, leash and repair kit. As usual, Bestway products have a way to making their consumers happy. The Cruiser Tech has great speed and is indeed great for touring. It is very smooth and has impeccable maneuverability. The storage system could not go unnoticed. Except for the fact that it does not come with a paddle (most iSUPs do so people expect it) riders are happy they settled for the Cruiser Tech. The Hydro-Force Fastblast is for the adventurous souls that love speed and racing. It has a streamlined shape and cuts through the water with admirable agility. It is 12’6” long and long SUP boards have a reputation of being fast. The width is 30” which is enough for a speed board and the 6” thickness ensures your stability. These dimensions also favor other SUP variations so you can use it in other ways. At the front of the deck is a strategically placed bungee system to let you carry essentials like water, cell phone and whatever else you might need out in the water. It has one large central fin. The center carry handle gives you an easy time when carrying your Fastblast across the beach. This inflatable board comes with a deluxe backpack, a pump, repair kit, and leash. Everything about the Hydro-Force Fastblast Tech SUP is worth loving. It is easy to inflate and deflate and performs very well on the water. The accessories included have saved paddlers time and money. The only thing you have to buy is a paddle and you are ready to go. The iSUP looks well made and there are no complaints—although people would appreciate a paddle in the package. The Megablast Tech is living out its name. This is probably the biggest paddleboard in the market. How would you like a board that accommodates the entire family? Instead of paddling side by side, you can do it together as a team. There is enough space for 6-8 people on this single board. It measures 17’ x 7’ x 8”—there is no question about its stability. Because it is meant for several riders, the Megablast is made of military-grade PVC and Dropstitch construction for unmatched durability and strength. There is no way you can make this one sink in the middle unless you plan on having huge rocks on board. 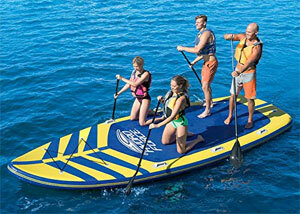 The paddleboard features six carry handles for several people to carry easily. There is a bungee system for carrying refreshments and other essentials. It also has quick inflation and deflation valves so you do not get worn out before you hit the water. There is a traction pad covering a big part of the deck. The package includes two pumps, four paddles, repair kit and carry handle. The Megablast Tech is one of a kind and clearly people have waited for something like this for a while. Any family of paddlers is bound to get excited over this impeccable product. This gigantic iSUP is very strong and stiff. It does not bend at the middle and it lasts long. Of course riders are excited about the four paddles and two pumps. It would be very exhausting to try and inflate it with one pump. Overall, the Megablast is awesome and it has no negative reviews. Bestway does have great products. The above 2018 models are proof of that. They are all amazing and unique in their own way. There is something for everyone, whether you love Yoga, touring, racing or paddling with the family, you are catered for. 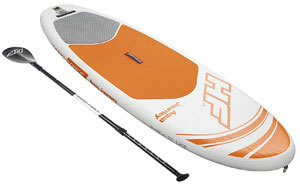 If you consider buying a Hydro Force paddle board, in particular have a look at their 6″ models. The extra 1.25″ will make these boards more stable and give you a bit more buoyancy and an overall better SUP experience. The Bestway Hydro Force paddle boards are cheap yet made with skill by experts who have been doing this for long enough. There is no reason why you should not have your own iSUP now. Hi Wendy, sure have a look at these SUP pumps for instance.